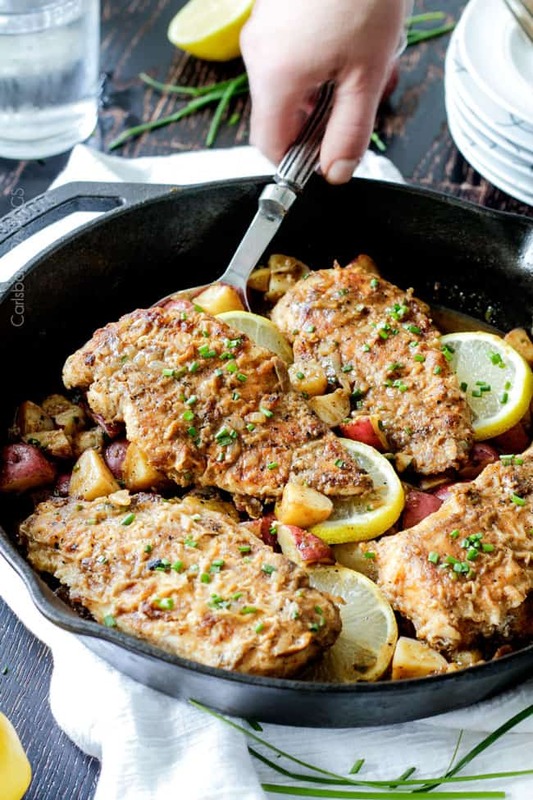 Chicken and Potato Skillet in Creamy Lemon Paprika Sauce – quick and easy one pan meal (and one microwave dish), on your table in 30 minutes! 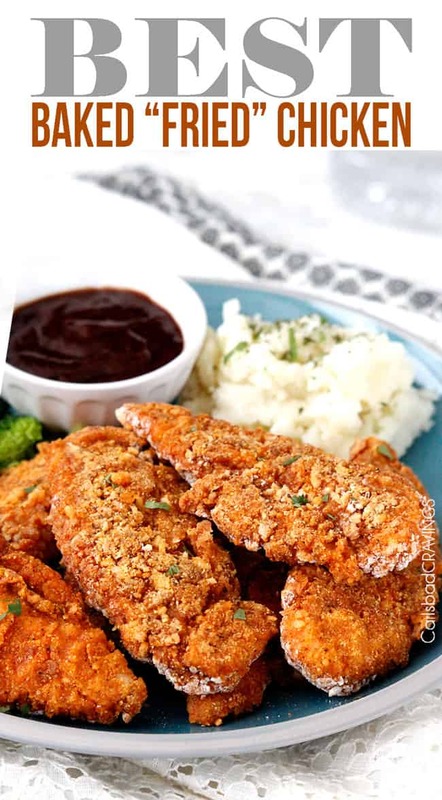 The potatoes finish cooking in the incredible sauce so they are SO flavorful and you will love the crispy chicken! 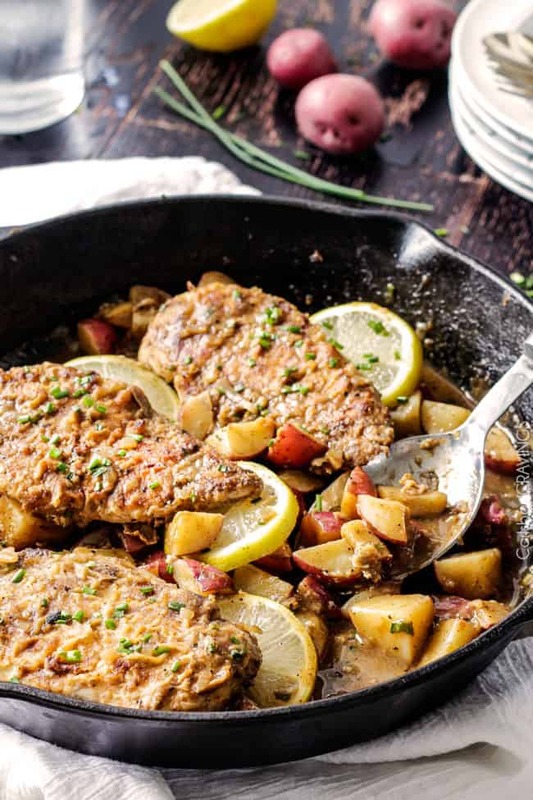 I am always looking for different ways to prepare chicken and I am always giddy over new sauce combinations, so this Chicken and Potato Skillet in Creamy – no cream – Lemon Paprika Sauce is making my taste buds do cart wheels. After all, crispy + creamy = L.O.V.E. 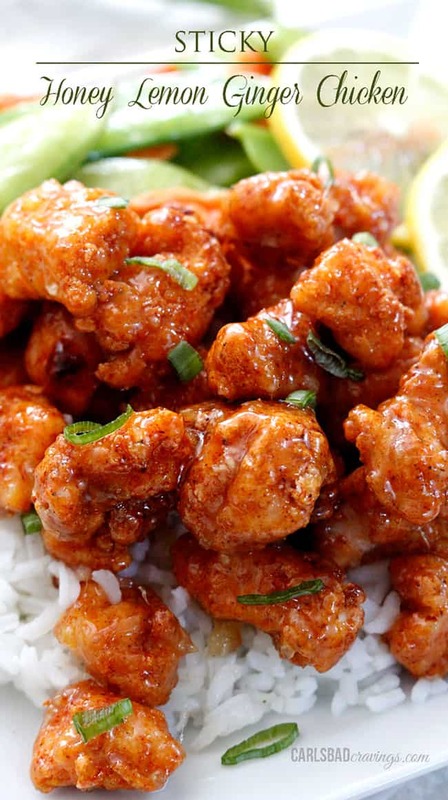 I have always loved lemon and paprika together, even pairing them in my Asian Sticky Honey Lemon Ginger Chicken but when you also mix in pinches of cumin, oregano, fresh chives, you have a flavor explosion that is nothing short of savorlicious. 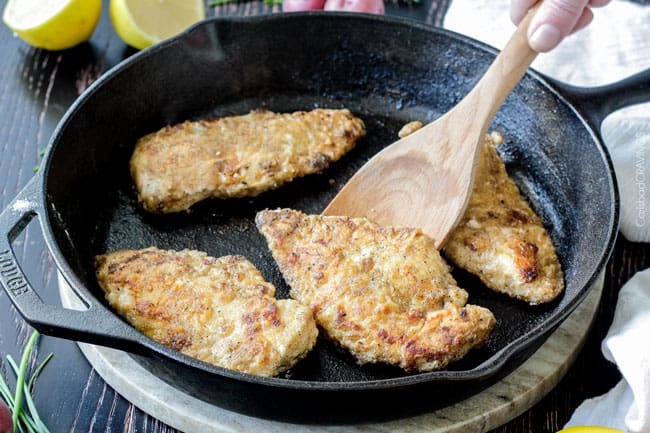 To make the chicken, first slice your chicken breasts in half horizonatally so your chicken cutlets are nice and thin (and tender!) and can crisp up in mere minutes after you dredge them in seasoned flour and pan fry in just 2 tablespoons oil. 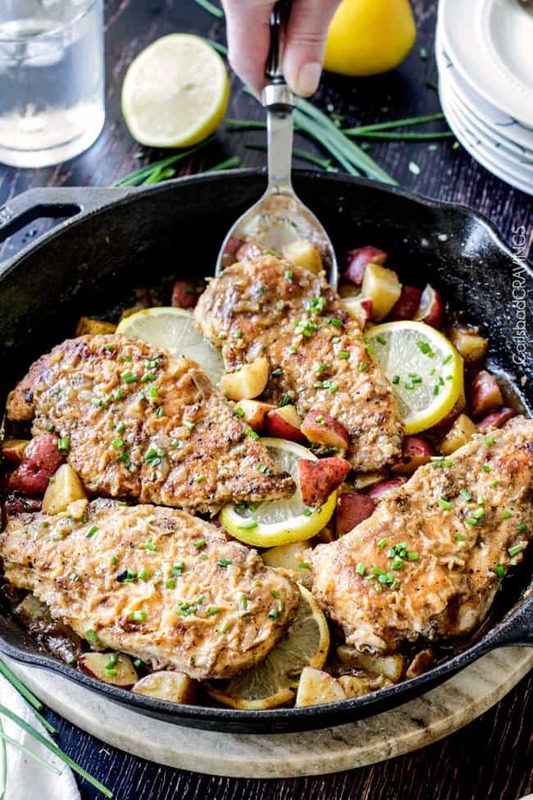 While you chicken is cooking, you are taking a smart shortcut with your potatoes and microwaving them until they are almost cooked, so now all you have to do is add them to the skillet and saute them with your shallots, garlic and a sprinkling of flour to thicken your sauce – your no cream sauce. Then add your chicken broth, paprika, cumin, and oregano and simmer away to create a creamy sauce that permeates your tender potatoes as it thickens. 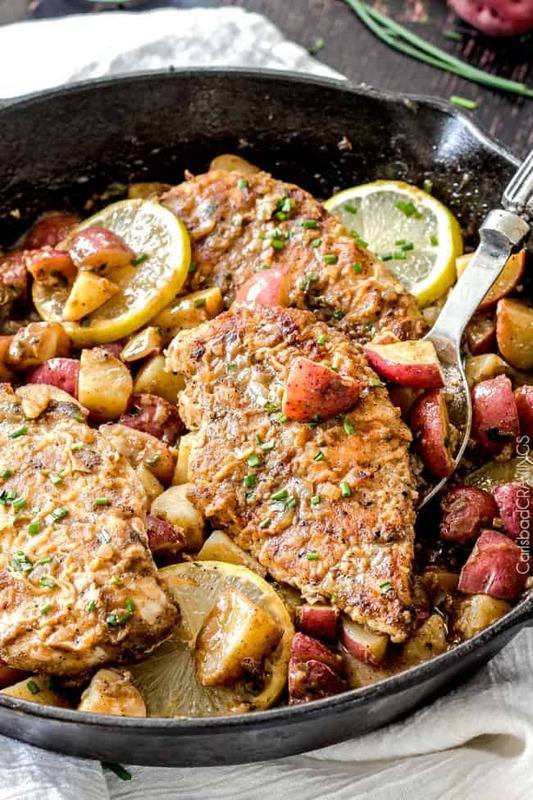 Stir in your lemon juice and chives for a fresh, bright tang and your saucy potato skillet is just begging to smother your tender chicken. 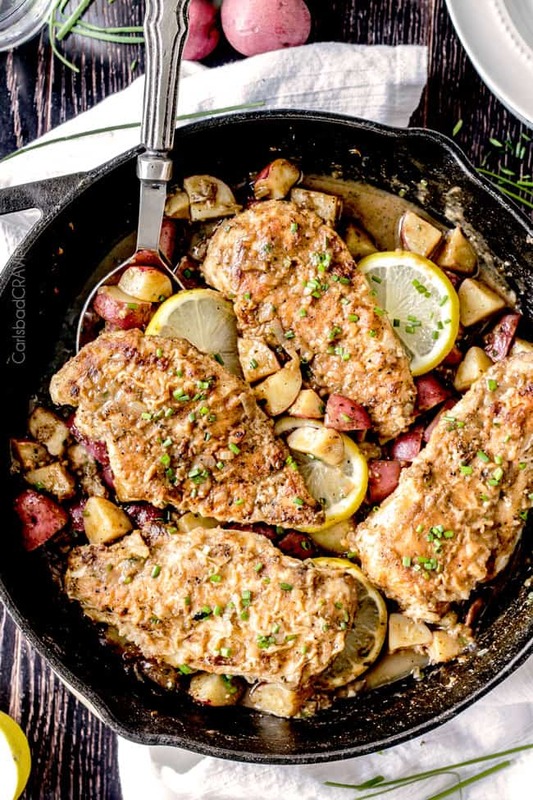 Chicken and Potatoes in Creamy Lemon Paprika Sauce on your table in 30 minutes, but tastes like you’ve been slaving away. Thank you Chicken and Potato Skillet. You are a beautiful deliciously deception. On a large plate or shallow bowl, whisk together 1/4 cup flour, 1/2 teaspoon paprika, 1/4 teaspoon salt and 1/8 teaspoon pepper. Half chicken horizontally, rinse and pat dry with paper towels then dredge each cutlet in the flour mixture. Set aside. Add potatoes to a microwave safe dish and add 3 tablespoons water. Cover and microwave for 6 minutes. Meanwhile, heat 2 tablespoons oil in a 12 inch skillet over medium high heat until very hot. Add chicken and cook until golden brown on bottom, about 3 minutes, flip, reduce heat to medium and continue to cook for 2-3 minutes or until completely cooked through. Transfer to plate. To the now empty skillet, melt one tablespoon butter in 2 tablespoons olive oil over medium high heat. 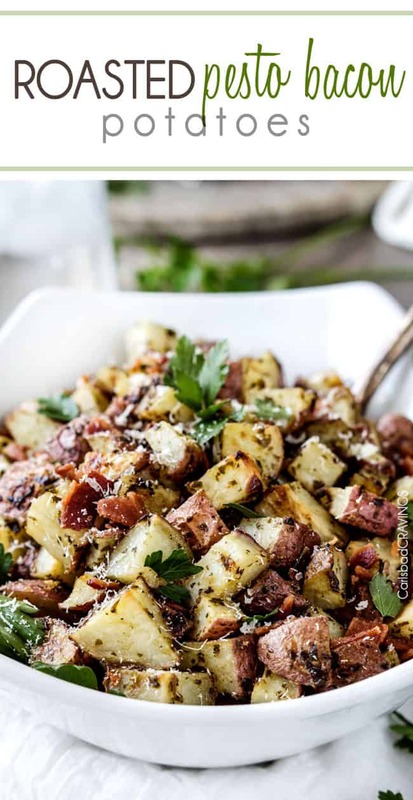 Add microwaved potatoes (without any remaining water) and shallots and saute for 2 minutes. To make the sauce, add flour and garlic to the potatoes and cook for 2 more minutes. Turn heat to low and slowly whisk in chicken broth followed by paprika, cumin, oregano, salt and pepper. 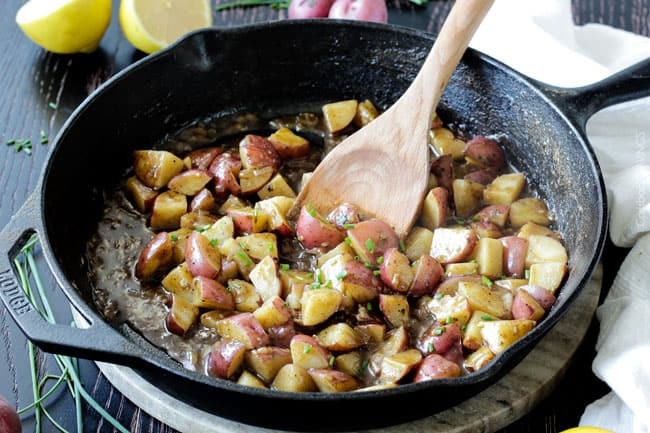 Bring to a boil then reduce to a simmer, stirring often, until sauce has thickened and potatoes are cooked through, approximately 5-7 minutes. If sauce thickens before potatoes are completely tender, stir in additional chicken broth. When potatoes are tender and sauce has thickened, stir in chives and lemon juice. Add chicken to skillet and cook for 1 more minute to reheat chicken. Serve immediately, seasoning individual servings with additional salt and pepper and freshly squeezed lemon juice to taste. Sheer genius making the potatoes partially in the microwave first. And do I ever love the idea of cooking everything in one skillet. We have chicken at least twice a week and this will be a great addition for my file. 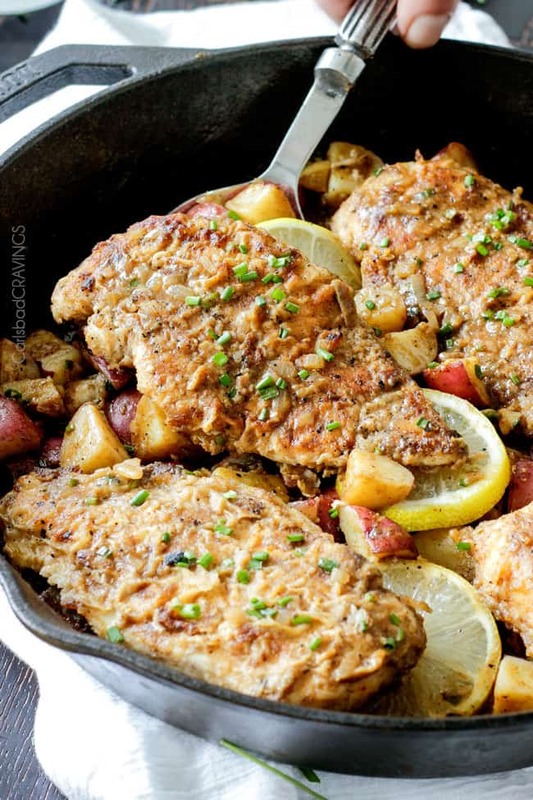 We have a recipe we make on the grill with chicken and potatoes but this is excellent for nights when we are cooking indoors. Have a great day, Jen! Thank you Marisa, I am too impatient to wait for my potatoes to cook all the way in the skillet so the microwave saves my patience 🙂 I love chicken and potatoes together – they are just so comforting! You recipe on the grill sounds delicious! This looks AMAZING! I can’t wait to try it. Perfect for those busy nights! Hi Jen! Even though we are retired we still eat dinner later than most (7:30 to 8:00 p.m.) – a habit from when we were working 8-10 hour days in our law office. 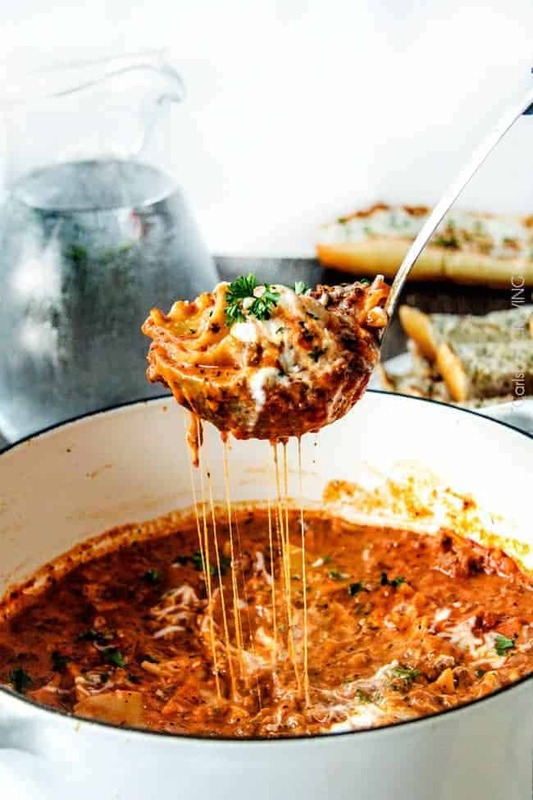 Some nights I don’t even think about what we’re going to have until well after 6:00 and this recipe is exactly what I need! Easy and delicious and on the table in short order! Thanks! What a lovely weekday dinner, Jen! Your photographs are so gorgeous that I can practically smell and taste this dish just by looking at it! I will definitely give it a try! Pinned and Yummed! Thank you so much Tania, you are too kind! And what a gorgeous site you have, I loved scrolling through your beautiful recipes. I am looking forward to seeing more of you on IG! This may be a stupid question, but all I have is smoked paprika. Will that make too big of a difference? Hi Lindsay, not a stupid question at all! 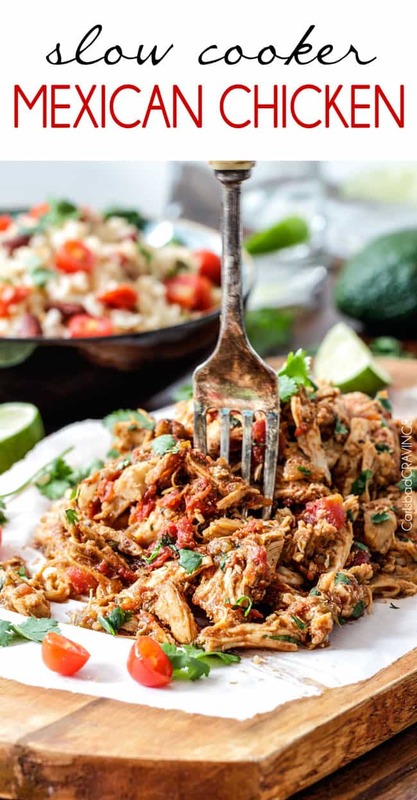 I find smoked paprika to be big, bold and an overall stronger flavor than regular paprika, so if you were to substitute, I would use half and expect a somewhat smokey flavor. Hope that helps! Hi Monica, thank you for all your awesome comments! I’m sorry its taken me a while to get back to you as I’ve been a little under the weather, but I truly appreciate all your time in commenting! Your comments are a ray of sunshine – just like you sound – and make my cooking and sharing so much more fun and fulfilling, so thank you for being your awesome self! 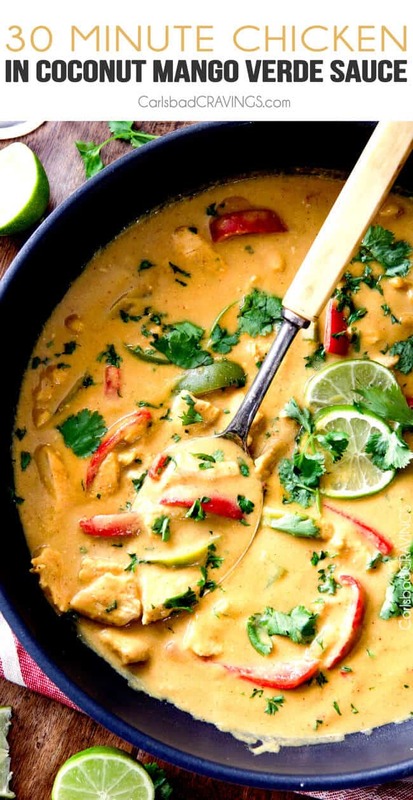 I’m so glad this was another winner and made it to your recipe binder! I’m excited to hear what your latest favs are! 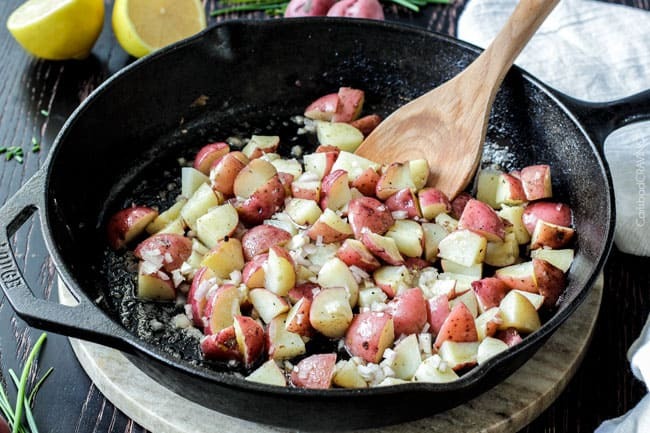 This may be a stupid question but do you clean the skillet before you start cooking the potatoes in it or do you keep the chicken juice leftovers?